After a while though, the thick clouds that had covered most of Iceland and a good deal of the Ocean thinned. Underneath lay not sea but land: America! I was really excited when I saw what probably was nothing but a little stretch of Nova Scotia but my excitement only deepened as the plane flew lower. Soon we were hovering over the United States and I could make up some shapes down on the ground. Cars, thousands and thousands of cars drifting over long asphalt lanes. As we neared the ground I could make out some buildings, houses, factories, warehouses. Lots and lots of brick buildings, more than I had ever seen before and uncountable sports field dedicated mostly to golfing and baseball. Shortly thereafter, the plane landed successfully on the grounds of the JFK airport. 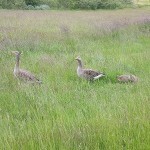 Technically we saw these cute goslings in Iceland, but we didn’t have so many photos for this post. Once the initial excitement passed and the ocean was crossed, one more obstacle had to be met: Immigration! 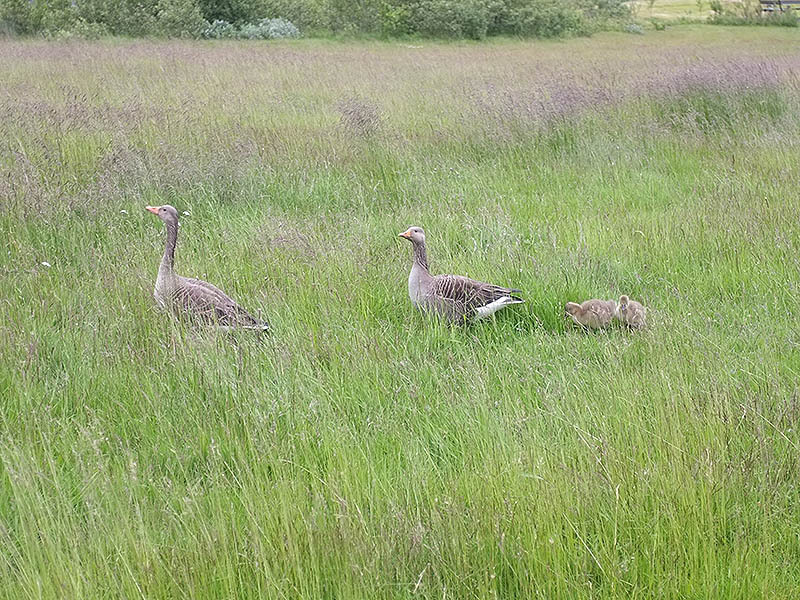 Linnea had warned me months in advance about the nastiness of the immigration officers and filled my head with countless tales of horrors where innocent passengers are kicked out of the country forever upon a misplaced joke. Thankfully, nothing like that happened to me and the only pain I had to endure was to stand in line for almost an hour. Once I reached the end of the line I only had to state my business, got my passport stamped and go. It took like, less than a minute. It was only after this little procedure that I was finally allowed to set foot on the soil of the United States of America. And what a glorious soil: literally the first things I caught a glimpse of were a Starbucks and a Subway. For sure, we were definitely not in Europe anymore. 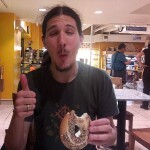 Lyonel enjoys his first bagel ever in New York Penn Station and gives it a thumbs up! More seriously, it was a crazy scorching day in New York when we arrived. All dressed up Scandi-style and with two bags each it felt like a cooking pot. Despite the scorching heat we had no time to lose and a couple trains to take, the convoy to Pennsylvania would not wait forever. 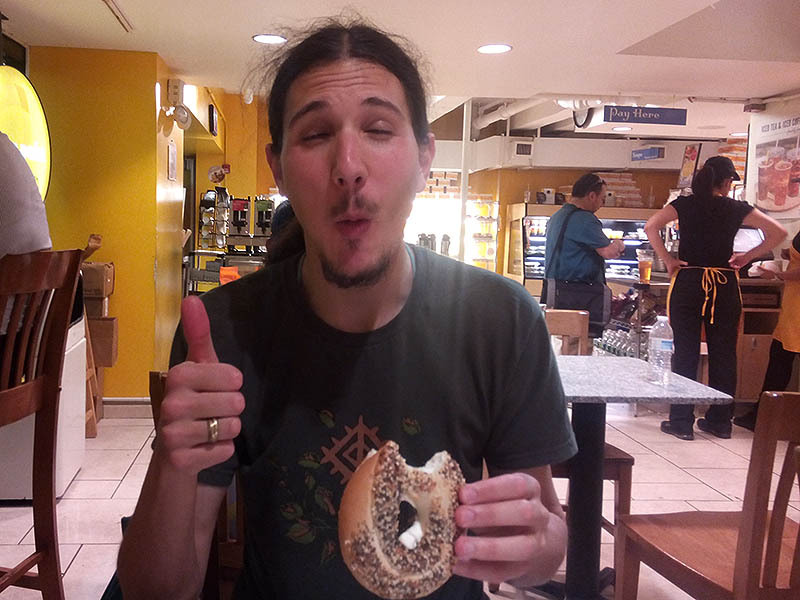 But it did wait long enough for us to get something to eat at the station: I had the opportunity to enjoy my very first Bagel (with cream cheese!) and Philly cheesesteak (with fat and grease!). That was sooo good that it almost offset the fact that the train that was supposed to take us from New York to Pennsylvania had been…eight hours delayed!